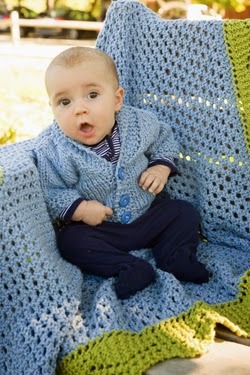 Our newest pattern book, in stores now, is all about baby. We shot The New Generation at the end of August last year at a beautiful, small public garden in Hollis NH. We had so much fun with our three adorable models! 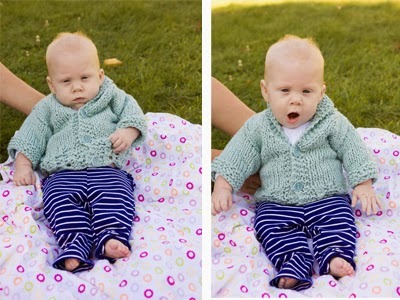 But photographing babies is always a challenge. First there is the challenge with babies too young to sit up on their own. 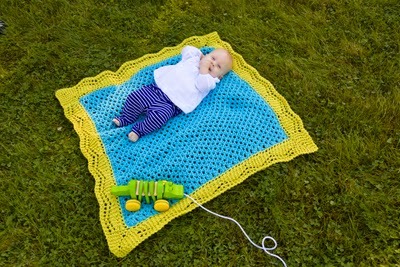 Here is Kayla, on her back, lying on the Marion blanket, knit in Sprout. Lying down works for blankets but not so well for sweaters. For sweaters we need a helping hand. 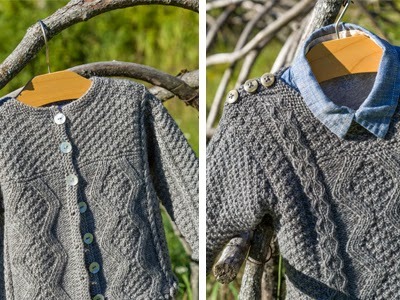 And even with Mom’s support, it’s difficult to show off that sweater (Betty Ann in Sprout). We tried propping up our model Cameron in the corner of a bench – what you can’t see is mom’s hands, just out of the shot, ready to grab him as he slides off the bench. After a couple of hours of top speed, non-stop running, Lili (above in Fannie in Liberty Wool) had a nap but the rest of the crew had to carry on and finish the model-less shots - including Edwina and Edwin in Mohawk Wool shown below. 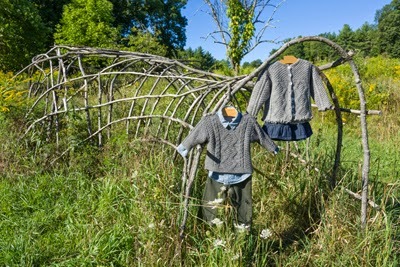 The Edwin Pullover and Edwina cardigan use the same cable in different ways. Both are truly heirloom pieces and each also has a coordinating hat. View all thirteen designs for baby in The New Generation here.